I bought an Iron Gym Pull Up Bar a few weeks ago. It arrived last Friday and I set it up on Saturday. It seemed a little flimsy, not only because the metal seemed fairly thin but also because the main bar is split in two and fitted together in order to allow the box to be smaller. 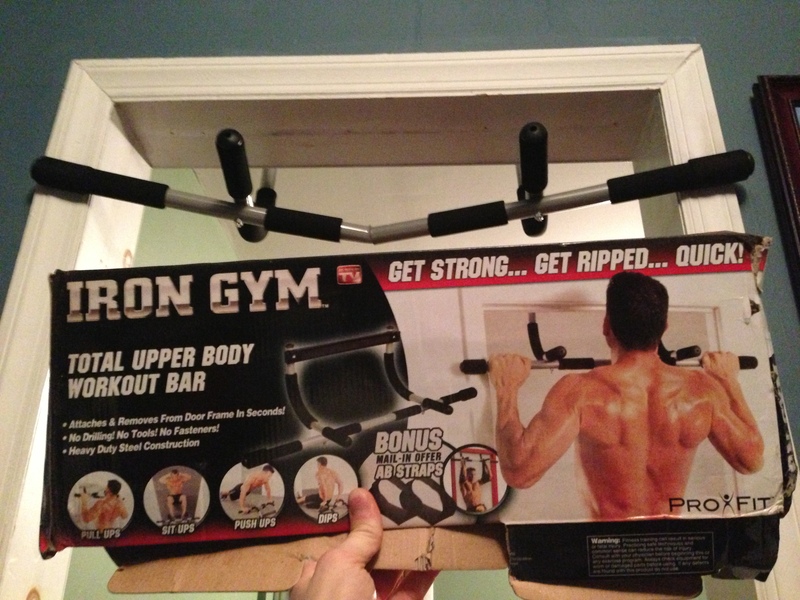 It has handles that allow you to do close grip or wide grip pull ups as well as handles for parallel pull ups. I probably did about 30 pull ups on on day one with no problems. I used the handles for all of the pull ups. On day two I did about 50 pull ups and the thing started creaking a little. On Monday I decided to up my pull up training and increased it to 200. Of the 200, I did 75 at the gym and 125 on the Iron Gym Pull Up Bar. On pull up number 196 the damn thing bent in half. Wow, what a low quality piece of garbage. Didn’t even last me one week. It isn’t like I am overweight either. I weigh about 170 lbs. Do not buy this product, it is awful! I guess I will be shopping for a new pull up bar tomorrow. This time I will spend the money and get a decent product. May be fake product? The original Iron Gym have 2 year warranty and have tested materials, never happened this way. Where did you buy this product? I just bought mine from Target, and this crappy bar broke on me after a week. I probably was doing around 50 pull ups a day. Very disappointing! Don’t buy! I learned my lesson too. I bought a perfect pull up and it has lasted over a year and a half and I have done thousands of pull ups on it, even with a weight vest. I can tell just by the color of it, that its fake. It may be fake, but if it is then you should be working with amazon to ensure that fake iron gyms aren’t being sold with your brand name for full price. I bought one off eBay and think it is fake as well. Came with 4 long screws, manual said “miniqi” was the brand and misspelled nutrition as “nutriltion”. Certainly a fake. I have used it a few times, still working on being able to do pull ups, but I do worry about the structural integrity of this thing. Like yours the bar came in two parts, I worry if I use the two grips in the middle that it might snap/bend as it seems weak there and does not stay in the socket. Damn Chinese counterfeiters make it look legit in the box with “Pro-Fit” but only after you open it and see you realize it is fake. The seller on ebay was very quick to refund my money and apologize, obviously doesn’t want me going to ebay or paypal and getting his store shut down. I don’t know where to buy the genuine version in Australia so not sure what to do. I’m so sorry for your case. In fact, there are many custommer good reviews about iron gym pull up bar. You may have purchased a fake. In this case you can contact with supplier to see how they explain.